I was travelling with my trusty travelling companion Cheeky and this time we were staying at the gorgeous 5 star hotel ‘The House’ on the exotic island of Barbados. Of course behind every great hotel there is a great restaurant and the restaurant in question was Daphne’s which is linked with the ‘Daphne’s’ restaurant back home in London, Chelsea. Along with ‘The House’, ‘Daphne’s’ is located in Paynes Bay on the Platinum West Coast of the island which is protected from the strong winds and rough seas that east coast is so famous for. 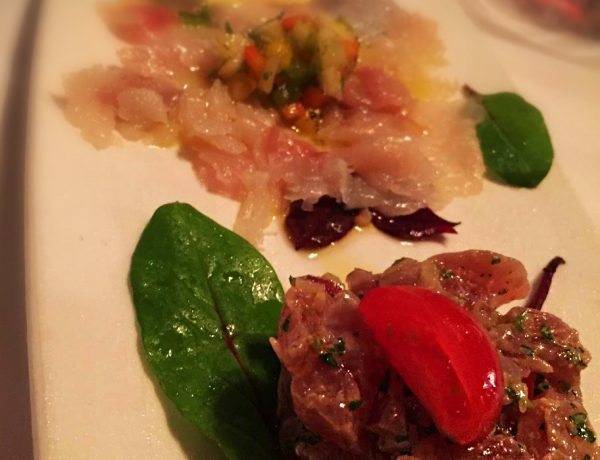 The food has an inspired mix of Italian cuisine plus local Bajan ingredients with every type of freshly caught seafood one could possibly desire. 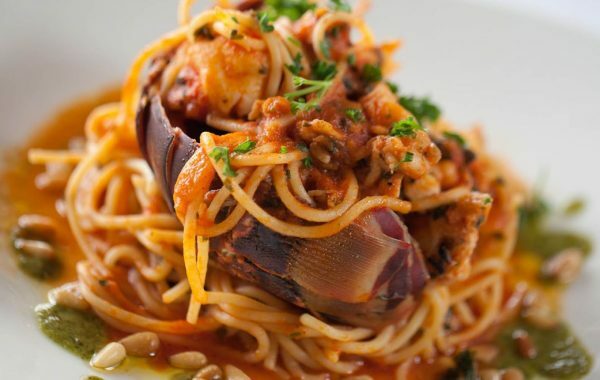 The Italian recipes and flare come from the Italian executive chef Marco Festini Cromer who has spent decades learning his art form across Europe and the Caribbean. The Menu looked fantastic but Cheeky and I were particularly impressed that they had a stand alone Gluten Free menu as well which did not hold back on the choices either. Of course, I was ecstatic by the presence of an Italian style menu, which meant that we would be eating many courses, so there was no fear of leaving the restaurant hungry. I also admired that fact that everything is made on the premises, from the breads and pastas to the Italian Gelati and sorbets. The restaurant itself has a wonderful atmosphere and the setting along with the interior has a luxurious but relaxed quality to it. We entered the restaurant along covered walkways from ‘The House’, which was fortunate because it was nearing the end of the rainy season and tonight the local weather deities decided to have one last blast before the summer was to move in for the season. It made the setting even more exotic and electrified, with torrential rain all around us as we sat at our table mesmerised by the open air view over the ocean. Quite the idyllic setting. 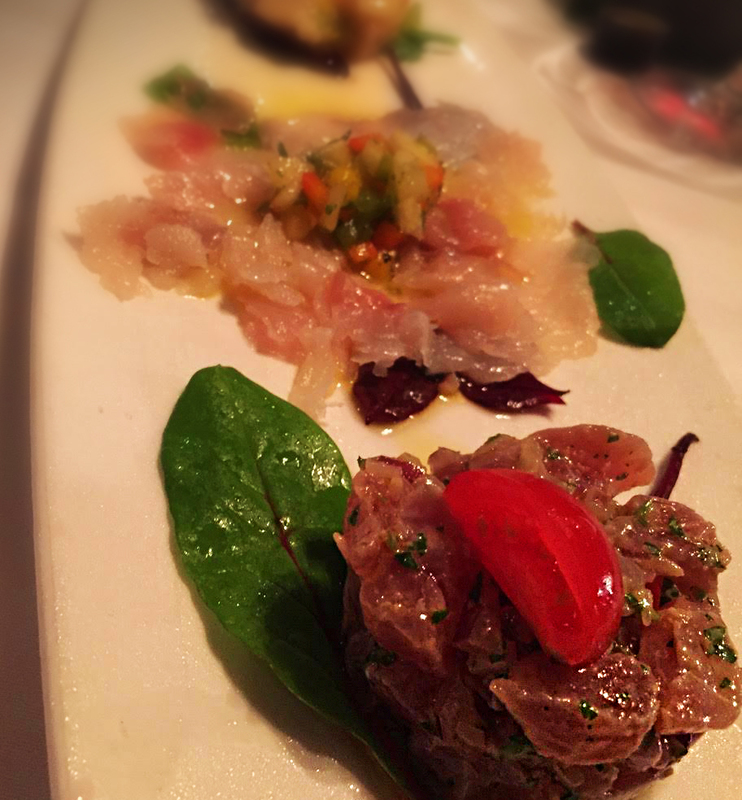 Our Antipasti course was to be Trio di Pesce Crudo Marinato, a seafood trio of Carpaccio of Kingfish, Tuna Tartare and Kingfish Ceviche which was exceedingly refreshing, exactly what we had been waiting for all day for. There is something quite romantic about eating seafood that you know has been caught that day in very local waters, If only I could eat like this every day. 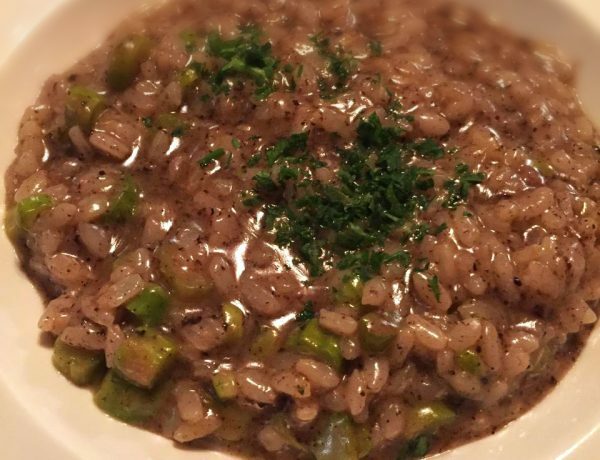 Truffles seem to have a bewitching enchantment over Cheeky, so when it came down to choosing the fresh Pasta or Risotto for the Pasta Fresca e Risotto course, Cheeky had to select the truffle risotto which was subtle yet delightful. I chose the gluten free spaghetti with shredded spicy crab which was fabulously spicy and almost had a Chinese flavour to it. As we had experienced in ‘The House’ the Bajan service was delightful. The Bajans are such a lovely people, so friendly and laid back that spending any time in their presence is a pleasure. We felt so relaxed whilst sitting in ‘Daphne’s’ that the rat race and stress of city life become something of just a distant memory. 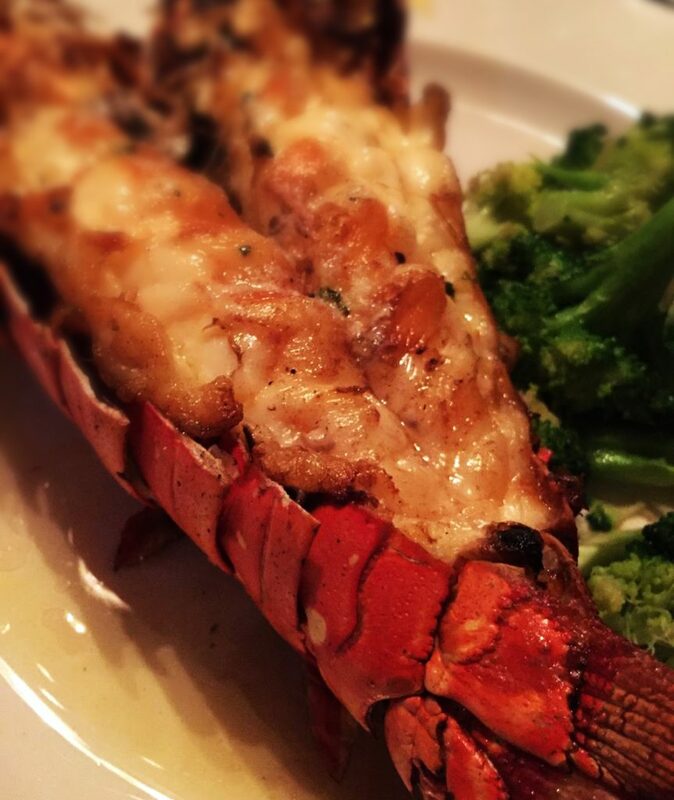 As we moved to Secondi Piatti Charlotte chose Caribbean lobster with garlic broccoli, sweet potato chips & spicy mayo, a simple yet thoroughly tasty dish, the lobster tail must have come from some kind of giant beast from 10,000 leagues under the sea! I opted for the Pan fried Swordfish with Tomato and white wine, olives and Mozzarella which was soft, tender and unforgettable. Throughout the meal we drank the red italian wine Montepulciano D’Abruzzo from the Abruzzo region of east-central Italy. For dessert Cheeky opted for the Affogato of gorgeous vanilla ice cream with espresso and I chose the sorbet selection with such wonderful flavours as Apple and ginger. On Tuesday nights ‘Daphne’s’ also put on a typical Bajan dinner beach buffet for us. 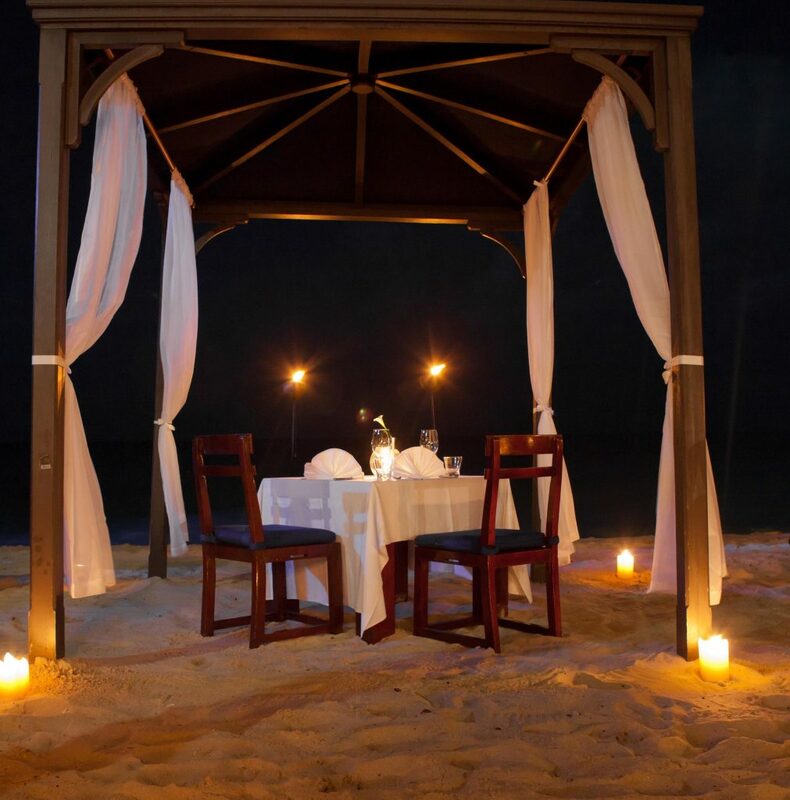 The setting was beautiful, with a beach canopy with matching comfy directors chairs and flaming oil lamps to light our way through the dinner. As both lovers of seafood we both devoured the absolutely delicious Octopus starter as soon as it arrived. 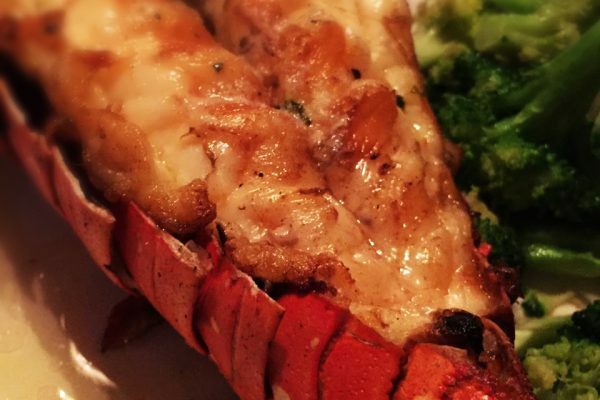 For main course it was straight to the fantastic Lobster tail with sweet potato chips, we were in our element. I finished the meal with frozen berries and white chocolate sauce… Ohh! If only I could eat like this every day. You never forget an evening at ‘Daphne’s’. 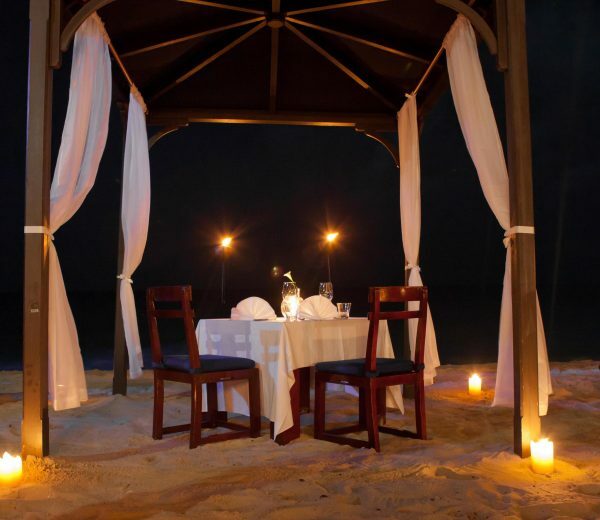 The laidback charm and the romance of the setting make for a memorable evening. 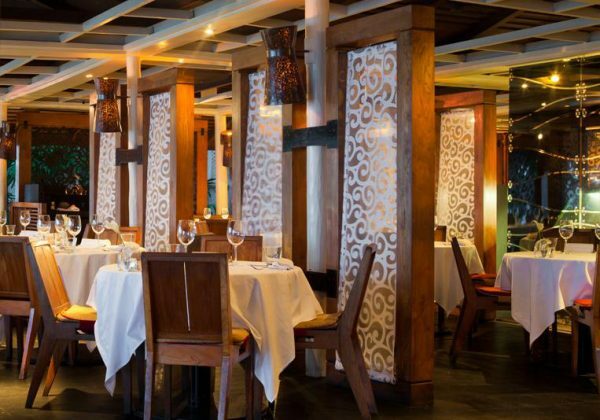 The restaurant is famous for a reason, it regularly sees famous actors, models and singers drop by experience the Bajan hospitality with fine Italian/Bajan fare. You know it is good when the likes of Rihanna visit each time she comes home.